Surf 'n' Turf has introduced school pupils across Orkney to using hydrogen, with a challenge to build a model car that is powered by a hydrogen fuel cell. 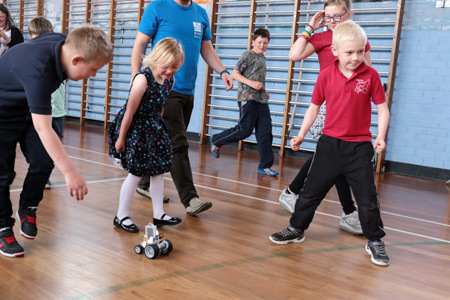 The project's own fuel cell is under construction, but the company supplying it – Arcola Energy – brought miniature versions to Orkney for schools to use in a Hydrogen Challenge activity session. The challenge? To make a model car that goes the furthest distance using a fixed amount of hydrogen gas as its energy source. The Arcola team have spent two weeks running daily workshops at schools around the islands, with some evening sessions for grown-ups too. The picture shows the race action at Shapinsay Primary School.